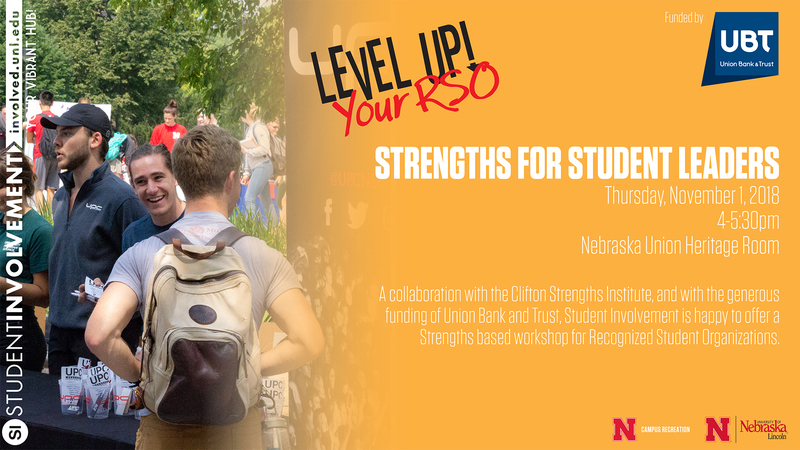 In collaboration with the Clifton Strengths Institute and Union Bank and Trust, Student Involvement will offer two strengths workshops for leaders or recognized student organizations from 4 to 5:30 p.m. Nov. 1 and Nov. 13 in the Nebraska Union, Regency Suite. The workshops will help students learn how individual strengths can help organizations be successful. Students will also explore how different teams work together and how to use individual strengths to build a great team. Those interested can register on NVolve U in the student involvement portal, located under the forms tab. For more information, contact Kat Grier at kgrier3@unl.edu or Melissa Griffith Phelps at mgphelps@unl.edu.